One of Uber’s self-driving cars killed a pedestrian crossing the road at night because its emergency braking systems were turned off, according to an investigation by the US government's National Transport Safety Board. The watchdog's four-page report released on Thursday is a grave reminder that today's autonomous vehicles are helpless at crucial moments, and still require "attentive human operators." In March, one of Uber’s computer-controlled Volvo XC90 vehicles, while in self-driving mode, hit a 49-year-old woman pushing her bike across a road in Tempe, Arizona. The crash killed her. The human driver was unhurt. When video footage of the smash was released by police, initial questions were directed at its LiDAR systems. Why did its all-seeing sensors fail to detect her? The report, however, showed LiDAR did spot her about six seconds before the impact, when the vehicle was driving at 43 MPH. But nothing was done by the machine to stop. Below is a video capturing the moments before the fatal collision. Uber’s computer-vision software initially classified her as an unknown object, then as another vehicle, before deciding she was actually a bicycle and couldn't predict the direction she was going to go. View of the self-driving system data playback at about 1.3 seconds before impact, when the system determined an emergency braking maneuver would be needed to mitigate a collision. Yellow bands are shown in meters ahead. Image credit: NTSB. At 1.3 seconds before the crash, Uber’s systems realized that the car needed to brake immediately to avoid smashing into her. But it didn’t bother because such emergency braking maneuvers are disabled when the car is in self-driving mode, to "reduce the potential for erratic vehicle behavior," according to Uber. To make this clear: Volvo ships cars with collision avoidance and automatic emergency braking technology built in, but these safety features are disabled by Uber. And Uber's self-driving vehicle software doesn't do any emergency braking of its own. So no automatic emergency braking. Instead, according to Uber, via the transport board, “the vehicle operator is relied on to intervene and take action. The system is not designed to alert the operator” when it thinks immediate braking is needed, which seems a rather large oversight to us. To put it more bluntly, this self-driving car cannot really self-drive at all. Humans still need to take over when necessary, and the braking system appears to be so unreliable and jumpy that it doesn't even alert the driver if there's a potential emergency. It's up to the person behind the wheel to be paying attention, and quickly slow the vehicle if something goes wrong. The car certainly isn't going to do anything about it. Unfortunately, in this accident, the driver was not paying attention to the road, and was looking down moments before the collision. Although the driver managed to turn the steering wheel less than a second before the impact at 39 MPH, in an attempt to swerve out of the way, it was too late. The accident is the first death by an autonomous vehicle on an American public road. The car was traveling on a well-known test route, was completing its second lap, and had been under the control of a computer for 19 minutes before the crash. 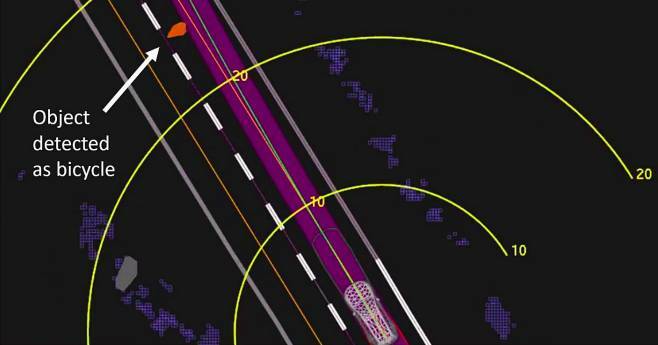 “The self-driving system relies on an underlying map that establishes speed limits and permissible lanes of travel,” the safety board's report stated. "The system has two distinct control modes: computer control and manual control. The operator can engage computer control by first enabling, then engaging the system in a sequence similar to activating cruise control. The operator can transition from computer control to manual control by providing input to the steering wheel, brake pedal, accelerator pedal, a disengage button, or a disable button." The watchdog said it would continue gathering evidence to piece together an accurate account of the car crash, with the hopes of issuing safety recommendations to prevent further crashes. It is also interested in what the pedestrian was up to before the crash, and is calling any potential witnesses to contact them via email: witness at ntsb dot gov. Toxicology results showed she tested positive for methamphetamine and marijuana. "Over the course of the last two months, we’ve worked closely with the NTSB,” an Uber spokesperson told The Register. "As their investigation continues, we’ve initiated our own safety review of our self-driving vehicles program. We’ve also brought on former NTSB chair Christopher Hart to advise us on our overall safety culture, and we look forward to sharing more on the changes we’ll make in the coming weeks."